Copyright ©2001 by The Oceanography Society. Further electronic distribution is not allowed. To illustrate the sensitivity of the gas transfer velocity and thus the sea-air CO flux to wind speed, we have estimated the regional and global net sea-air CO fluxes using two different formulations for the CO gas transfer coefficient across the sea-air interface: the quadratic U dependence of W-92 and the cubic U dependence of W&M-99. In addition, we have demonstrated the effects of wind-speed fields on the computed sea-air CO flux using the National Center for Environmental Prediction (NCEP)-41 mean monthly wind speed and the NCEP-1995 mean monthly wind speed distributions over 4° × 5° pixel areas. In Table 2 the fluxes computed using the W-92 and the NCEP/National Center for Atmospheric Research (NCAR) 41-year mean wind are listed in the first row for each grouping in column one (for latitudinal bands, oceanic regions and regional flux). The column "Errors in Flux" located at the extreme right of Table 2 lists the deviations from the mean flux that have been determined by adding or subtracting one standard deviation of the wind speed (about ±2 m sec on the global average) from the mean monthly wind speed in each pixel area. These changes in wind speeds affect the regional and global flux values by about ±25%. The fluxes computed using the single year mean wind speed data for 1995 are listed in the second line in each column one grouping in the table. The global ocean uptake estimated using the W-92 and the NCEP 41-yr mean wind speeds is –2.2 ± 0.4 Pg C yr . This is consistent with the ocean uptake flux of –2.0 ± 0.6 Pg C yr during the 1990s (Keeling et al., 1996; Battle et al., 2000) estimated from observed changes in the atmospheric CO and oxygen variations. The wind speeds for 1995 are much lower than the 41-year mean in the northern hemisphere and higher over the Southern Ocean. Accordingly, the northern ocean uptake of CO is weaker than the climatological mean, and the Southern Ocean uptake is stronger. The global mean ocean uptake flux of 1.8 Pg C yr using the NCEP-1995 winds is about 18% below the climatological mean of 2.2 Pg C yr , but it is within the ±25% error estimated from the standard deviation of the 41-yr mean wind speed data. When the cubic wind speed dependence (W&M-99) is used, the CO fluxes in higher latitude areas with strong winds are increased by about 50%, as are the errors associated with wind speed variability. The global ocean uptake flux computed with the 41-year mean wind speed data and the NCEP-1995 wind data is 3.7 Pg C yr and 3.0 Pg C yr respectively, an increase of about 70% over the fluxes computed from the W-92 dependence. These flux values are significantly greater than the flux based on atmospheric CO and oxygen data (Keeling et al., 1996; Battle et al., 2000). However, the relative magnitudes of CO uptake by ocean basins (shown in % in the regional flux grouping in the last four rows of Table 2) remain nearly unaffected by the choice of the wind-speed dependence of the gas transfer velocity. The distribution of winds can also influence the calculated gas transfer velocity. This is because of the nonlinear dependence of gas exchange with wind speed; long-term average winds underestimate flux especially for strongly non-linear dependencies. To avoid this bias, the relationships are adjusted by assuming that the global average wind speed is well represented by a Rayleigh distribution function. As noted by Wanninkhof et al. (2001), this overestimates the flux. A more appropriate way to deal with the issue of wind speed variability is to use short-term winds. If the NCEP 6-hour wind products are used, the global flux computed using the W&M-99 cubic wind-speed formulation decreases from 3.7 to 3.0 Pg C yr for the NCEP 41-year winds and from 3.0 to 2.3 Pg C yr for the NCEP 1995 wind data. The relative importance of the major ocean basins in the ocean uptake of CO may be assessed on the basis of the CO fluxes obtained from our pCO data and W-92 gas transfer velocity (Table 2 and Figure 6). The Atlantic Ocean as a whole, which has 23.5% of the global ocean area, is the region with the strongest net CO uptake (41%). The high-latitude northern North Atlantic, including the Greenland, Iceland and Norwegian seas, is responsible for a substantial amount of this CO uptake while representing only 5% of the global ocean in area. This reflects a combination of two factors: the intense summertime primary production and the low CO concentrations in subsurface waters associated with recent ventilation of North Atlantic subsurface waters. The Pacific Ocean as a whole takes up the smallest amount of CO (18% of the total) in spite of its size (49% of the total ocean area). This is because mid-latitude uptake (about 1.1 Pg C yr ) is almost compensated for by the large equatorial release of about 0.7 Pg C yr . If the equatorial flux were totally eliminated, as during very strong El Niño conditions, the Pacific would take up CO to an extent comparable to the entire North and South Atlantic Ocean. The southern Indian Ocean is a region of strong uptake in spite of its small area (15% of the total). This may be attributed primarily to the cooling of tropical waters flowing southward in the western South Indian Ocean. Figure 6. 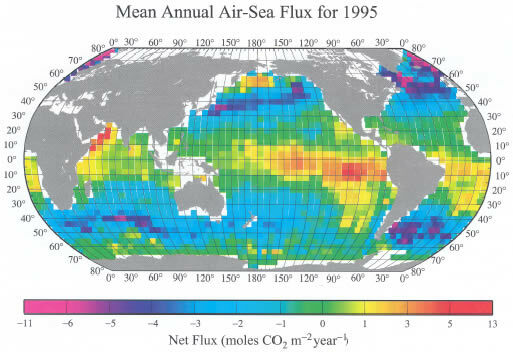 Distribution of the climatological mean annual sea-air CO flux (moles CO m yr ) for the reference year 1995 representing non-El Niño conditions. This has been computed using the mean monthly distribution of sea-air pCO difference, the climatological NCEP 41-year mean wind speed and the wind-speed dependence of the CO gas transfer velocity of Wanninkhof (1992). The yellow-red colors indicate a region characterized by a net release of CO to the atmosphere, and the blue-purple colors indicate a region with a net uptake of CO from the atmosphere. This map yields an annual oceanic uptake flux for CO of 2.2 ± 0.4 Pg C yr .